Ever since my girlfriends baby shower when I made those adorable Cookie Monster Cupcake Bites, I have felt inspired by all things baked and these are just adorable. 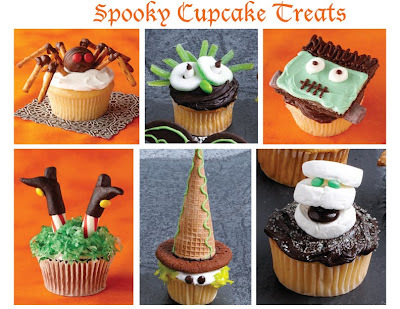 They are perfect for your upcoming Halloween parties and can be transitioned for any themed party. They are cute, ghoulish & easy to assemble. Better Homes & Garden featured the Frightful Cupcakes, and these are my top favorites out of the 17 featured. Cut or tear sour gummy straws in half and insert in the frosting. Use sour gummy rings for eyes. Place white jelly beans in each ring for the eyes and top with a mini chocolate chip. Place a green jelly bean under the sour gummy rings for the goblin's nose. Use black marzipan to make the shape of the witch's boots. Stick yellow mini M&M's on each boot for the buckles with frosting. Mold each boot around a peppermint sticks to create the legs. Top cupcake with coconut dyed with green food coloring. You could even change these up and make Santa Legs for Christmas. Place 3 slices of marshmallows on top of each cupcake. Place 2 small mint candies in between the top two marshmallow rings for the eyes; use frosting to help make them stick. Put a candy coated chocolate between the bottom two rings for the mouth. To convert this to a Christmas theme, you could take the same idea and create a snowman. Decorate a sugar cone with green icing. Place a chocolate cookie on top of a white frosted cupcake. Stick the decorated sugar cone on top of the cookie using melted chocolate. Place 2 mini candy-coated chocolates in the frosting for the witch's eyes. Tuck the dyed coconut under the sugar cone for the witch's hair. Frost a chocolate graham cracker square with tinted green frosting, leaving room at the top for hair. Place the frosted graham cracker on the cupcake. Use chocolate frosting to make spiky hair and Frankensteins mouth. Cut a small marshmallow in half for the eyes. Dot chocolate frosting on the marshmallows for pupils. Place 2 marshmallows colored with dye on either side of the cupcake for plugs. Place a chocolate truffle in the middle of the frosted cupcake for the spiders head. Use melted chocolate to adhere 2 red hots for the eyes. Cut 8 pretzel sticks in half. Dip the pretzels in melted chocolate to adjoin broken sticks for spider legs. Insert pretzel sticks in cupcake around the truffle. I saw something like these at a bakery near my house! i love them! I am definitely going to try and recreate them this Halloween!